Perfect location, near the "Machines de l'Isle". Clean. Courtesy. The location is great, the premises are clean, and the overall experience is good. The fact that you can cook in your room is a big plus. It served its purpose, and the staff were really nice. There was also a fully-stocked kitchen, which I wasn't expecting. The location is near to the most interesting places to visit in Nantes. Good location and in general, good hotel with this price. Location, location and location. A short walk across the bridge to the les machines de l'île de Nantes which was the main reason for my visit. Great location for the Isle de Machine, walk out the door, cross the bridge and you are there. Also, only 10 a 15 minutes walk to old centre of Nantes. Able to park car securely in underground car park. The place was clean and the staff generally helpful and welcoming. Brilliant location for l’ile des machines and tour de Bretagne - 32 floor building you can whizz up for one euro and view the city. Town very attractive in most places, friendly, great ice cream and the walking mechanical were fantastic. Bed comfy and all necessary kitchen kit available although only just 2 forks, cups, knives, bowls 4 glasses wine and water naturally. Microwave and two electric rings. Fridge. No tea towels but washing up liquid and sponge. I would stay again. Kitchen cupboards quite high. Husband enjoyed the breakfast and our room was really convenient for that! Located in the center of Nantes, this Appart’city residence is 150 feet from the Noter-Dame de Bon-Port Cathedral. It offers apartments with free WiFi, coffee maker and a TV. With a living room and sofa-bed, the apartments can accommodate 2 or 3 people. They also feature a kitchen equipped with a fridge, microwave, hob and bed linen is provided. 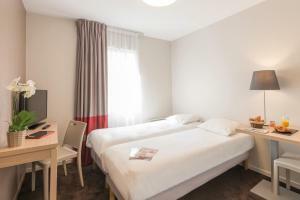 The Appart ‘city Nantes Quais De Loire residence provides a full buffet breakfast. It is free for guests under 6 years old and children between 6 and 12 years old can enjoy a reduced rate. Breakfast is composed of various breads, including gluten-free bread, pastries, fresh and hot beverages. Fresh fruit and fruit salad, as well as cheeses and yogurts are also provided. There is a tram way stop just outside the residence providing access to Nantes' main attractions, including the Graslin Theater and the Chateau of the Dukes of Brittany, as well as the Nantes Train Station. This is our guests' favorite part of Nantes, according to independent reviews. 뀐 Located in the real heart of Nantes, this property has an excellent location score of 8.2! 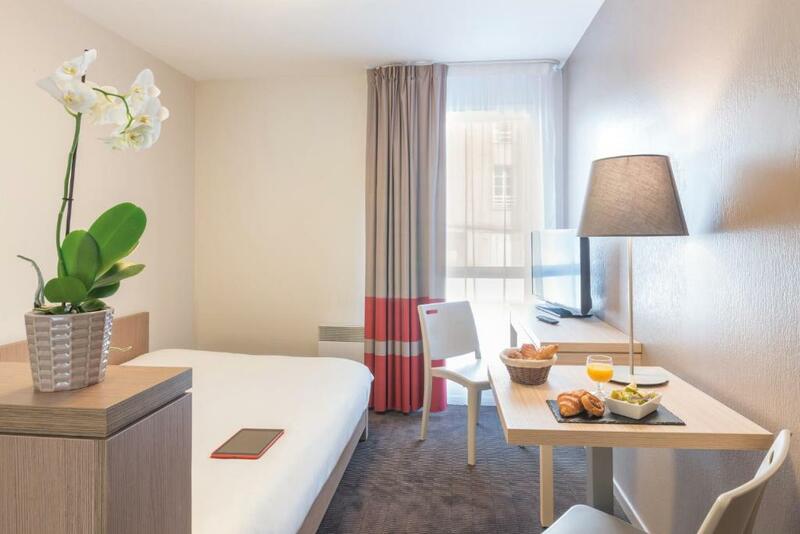 When would you like to stay at Appart'City Nantes Quais De Loire? This spacious studio apartment has a microwave, a fridge and a teakettle. A TV and a kitchenette with a refrigerator and a dining area feature in this en suite studio. This apartment features TV and a kitchenette with a kettle, a refrigerator and a dining area. This apartment features TV and a kitchenette with a dining area, a refrigerator and a kettle. More spacious apartment with a TV and a kitchenette with a microwave and a dining area. House Rules Appart'City Nantes Quais De Loire takes special requests – add in the next step! Appart&#39;City Nantes Quais De Loire accepts these cards and reserves the right to temporarily hold an amount prior to arrival. Appart'City Nantes Quais De Loire accepts these cards and reserves the right to temporarily hold an amount prior to arrival. End-of-stay cleaning is included for stays up to 3 nights. Weekly cleaning is included for stays up to 27 nights. Bi-weekly cleaning is included for stays of more than 28 nights. Additional cleaning is available at an extra cost. For nonrefundable bookings, guests will receive an email after completing their reservation with a link in order to make their payment online. For bookings of 7 nights or more, guests will receive an email after completing their reservation in order to have their credit card pre-authorized. A daily cleaning service is available for a fee. The luggage service costs EUR 2. Please note that photo ID and the credit card used to make the reservation will be required upon check-in. There was an incredibly loud party thrown by other guests in the hotel until about 5 in the morning and I ended up getting only four hours of sleep. I didn’t feel comfortable saying something myself as a woman traveling alone but the staff should have taken care of it. Admittedly I should have said something to the staff in the moment but I was so tired that i Just tried to continue sleeping (which failed because of the noise of the party). Not cool! In the kitchen, they don't have cutting board. Generally looks shabby and run down. There are signs up saying there will be refurbishment. Sorely needed. My room wasn’t ready at 3pm when I arrived. Wasn’t clean enough and the bed wasn’t comfortable. Little bit off the beaten track as it was down a dark alley. I booked this room at last minute for a one night stay in Nantes. The location isn’t that central compared to other places and I was on my own and found it a bi creeepy to be honest. There was a lot of noise outside all through the night so I couldn’t leave my window open and I was so warm! Hardly slept at all! Room is really basic and didn’t appear to be the cleanest! Hall ways smelt really bad! !